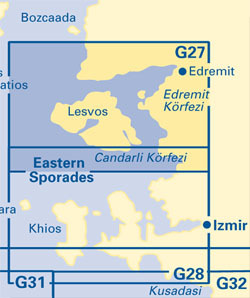 Shows the whole of Lesvos and the adjacent coast of Turkey. Scale: 1 : 185,300. Larger scale plans of Dikili and Ayvalik (Turkey), and on Lesvos the Entrance to Kolpos Yeras, the entrance to Kolpos Kollonis, Sigri, and Mitilini. On this 2014 edition, the chart has been fully revised and updated throughout. The new TSS in the approaches to Aliaga is shown, as are developments to the new Mitilíni Marina. Details of the recently deployed AIS transmitters are shown across the chart.